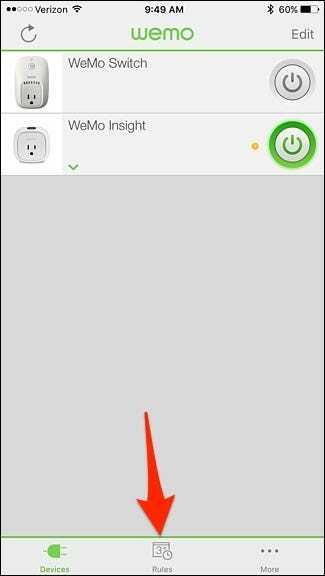 The WeMo Switch is a cheap and easy-to-use smart outlet that can turn anything with an on/off switch into a smart appliance, allowing you to control it from your smartphone. Plus, it comes with a small handful of automation features, including the ability to set a timer so that it shuts off automatically after a certain amount of time has elapsed. 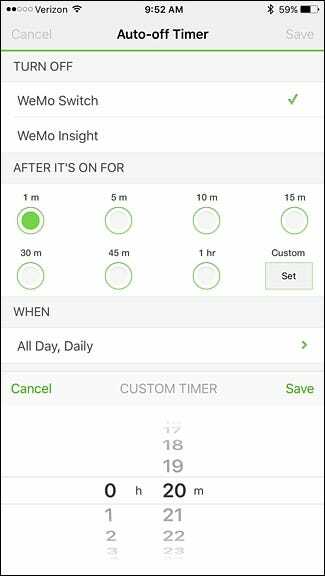 This can be done on either the regular WeMo Switch or the newer WeMo Insight Switch, and the process is the same on both. With the timer, whenever you turn on the switch, it will automatically begin counting down and turn off the switch after the set amount of time. When you turn it back on, it will begin the count down process again. This is great if, for example, you tend to fall asleep while reading, and want the light to turn off automatically. 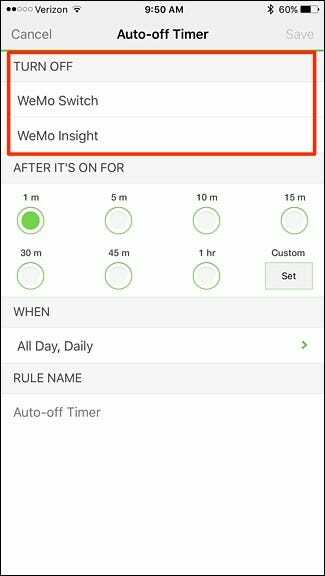 To start off, open up the WeMo app on your phone and tap on the “Rules” tab at the bottom. 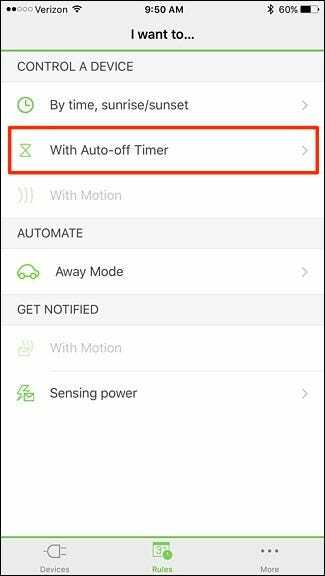 At the top under “Turn Off”, tap on the switch that you want to apply the timer to (if you have multiple WeMo Switches). 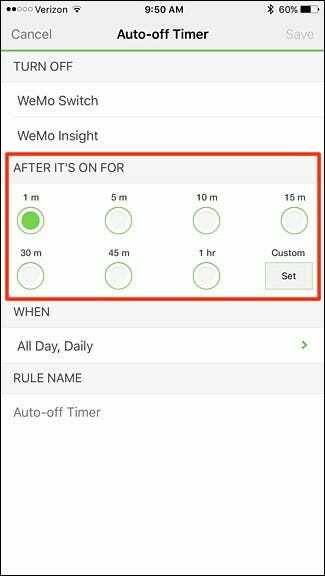 Next, set how long the timer will run before the WeMo Switch shuts off. There are predetermined times that you can select, but you can also choose “Custom” and tap on “Set”. 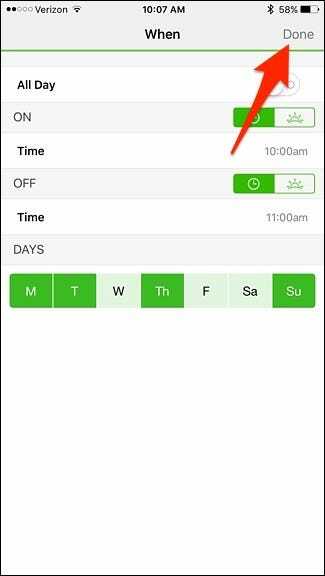 If you choose a custom time, use your finger to scroll the dial to the specific time you want to set and then tap on “Save”. 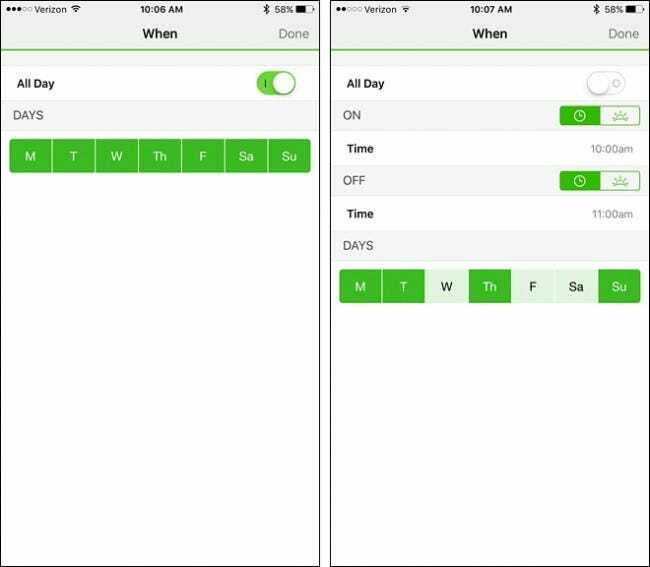 Next, under “When”, tap on “All Day, Daily”. 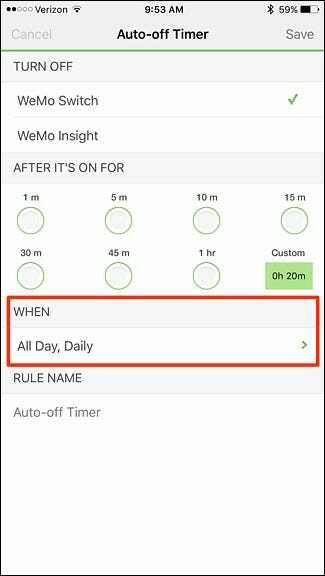 From here, you can choose when you want the timer enabled by picking certain days of the week, as well as even a time window. You can also just leave it as is to have the timer enabled at all times. After you set that up, tap on “Done” in the top-right corner. Under “Rule Name”, you can give the timer a custom name if you want. Then tap “Save” in the top-right corner of the screen. 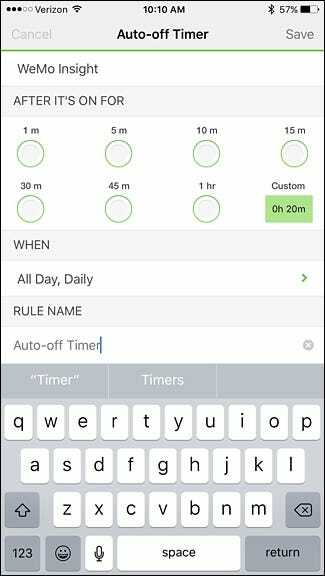 After that, the timer will appear in your list of rules. 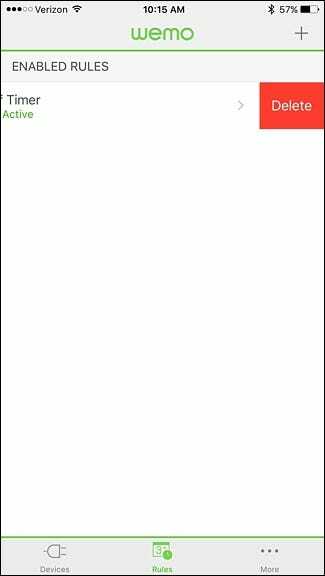 To delete it at any point, just swipe to the left and hit delete. You can also tap on the rule to open up more details about it, and then tap on “Delete Rule”. 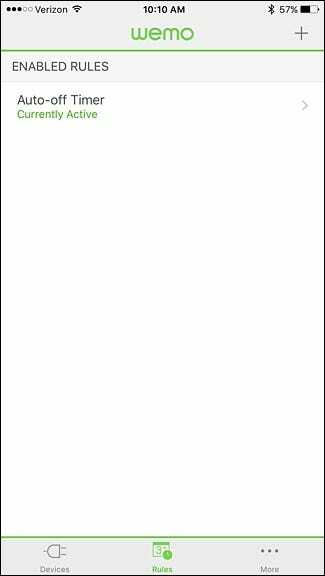 You can also quickly disable and re-enable the rule from this screen. 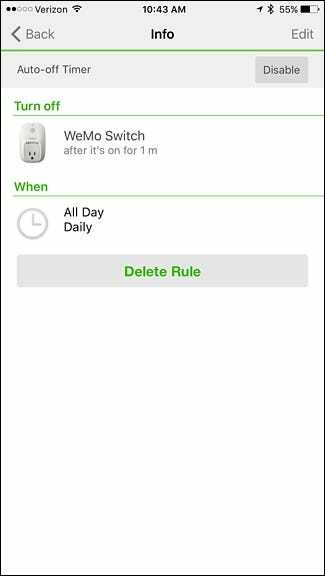 Unfortunately, there’s really no easy way to just set up a one-time quick timer and tell your WeMo Switch to shut off after 15 minutes (or whatever time you want). 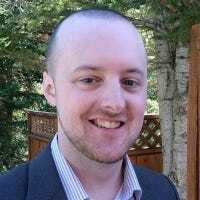 Instead, you have to set up a rule and customize it. But after you initially set it up, it’s easy to turn it on and off whenever you need to.